Vansh is an endearing child. His eyes shine with confidence and kindness. 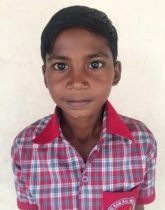 He prepared for mainstreaming at Aasraa’s Early Learning Centre on Kanwali Road before his admission into an English medium school in 2017. His father works at a liquor shop. He understands the importance of education and encourages both his children to study hard to live a better life. Vansh’s twin brother is a student at another English medium school. Vansh likes to read story books and wants to improve his language skills. He also enjoys playing football in school. He aspires to become a pilot.